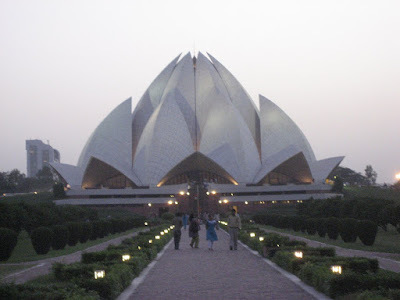 After work my driver took me to the Lotus Temple, which is a Baha'i house of worship. It was a beautiful building. Inside was a space for 2,000 or 3,000 people to be able to sit and pray. All religions are welcome here. Despite my insistence that my god requires I praise him through photography, the staff refused to allow me to take pictures inside the temple. The nicest part of the template was that it was situated on grounds that were large enough that, by the time I reached the template itself, the sound of the surrounding traffic was almost completely drowned out. After we left the Lotus Temple, I assumed Rahul knew I wanted to return to the hotel, because I was reluctant to even go to the Lotus Temple in the first place. I was really annoyed when I noticed we were pulling into a parking lot, and it wasn't the hotel's. I told Rahul that I wanted to return to the hotel. He said I should go inside and take a quick look. He had taken me to Delhi Haat Craft Cottage Industries, a tourist trap of a market. Since we were already there, I figured that I might as well go inside. Reluctantly I left the car, hoping I could find something to bring back for Kelley. As I entered the store I was assaulted by a man named Naresh. He explained that I arrived late and that usually his store is filled with tourists and shoppers. Then he explained to me some important rules I must follow in order to take advantage of the unique opportunity offered by his store. I was to walk to the back of the store and work my way to the front, being sure to stop at every single section. I wouldn't want to miss any of the quality products for sale, would I? Everyone pays the same price at the store (no haggling). Everything is high quality. Naresh told me all of this in a certain way that also told me "just do as I say so I don't have to repeat this to you over and over until you finally relent." You can make shirts, you say? Just as I had started tuning him out, Naresh mentioned that he can make shirts, pants and suits. I was actually hoping to get some custom-tailored shirts made when I was in India. Naresh asked me if he wanted to get fitted or if he should take the measurements from the shirt I was wearing. The shirt I was wearing happened to be a shirt that fits me well, so I had him measure the shirt I had on. He looked at my shirt and said it was made in India, that he could tell by the stitching. I showed him the "Made in China" label on the collar. 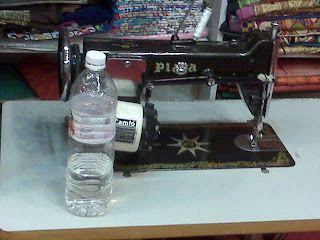 He said "Oh, they have started sewing the Indian way now." The shirts weren't as cheap as I had expected ($24/shirt), but they were still much less expensive than any shirt I could get back home. Hopefully they will fit properly and won't fall apart on first washing. Didn't you love what a hard time Anjam was giving you about the price of the shirts? I was like, "Shut it and let the man enjoy his bespokedness." Great word! I had to look this up in a dictionary. Kelley has a large, unabridged dictionary on display in our apartment, so I was able to find the meaning in an appropriately old-school manner. Anyway, Anjam is a player hater. Always has been, always will be.